The diversity and inclusion program in student activities proudly presents Día de los Muertos on Thursday, November 1, to be held in the quietside of Bauccio Commons. Sugar skull decorating and crafts will begin at 6 p.m., cultural performances ranging from Aztec dancers, danza de Viejitos, and Ballet Papalotl will start at 7 p.m., and the event will wrap up at 9:30 p.m. Join us for a night filled with traditional Mexican food, cultural danza performances, and traditional activities. Food and arts will be provided while supplies last. For any questions please contact Yuri Hernandez Osorio, student activities, at hernandy@up.edu. 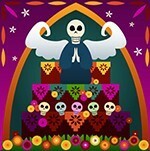 Dia de los Muertos is sponsored with love and support from ASUP, M.E.Ch.A, MESA, and Expresso UP.